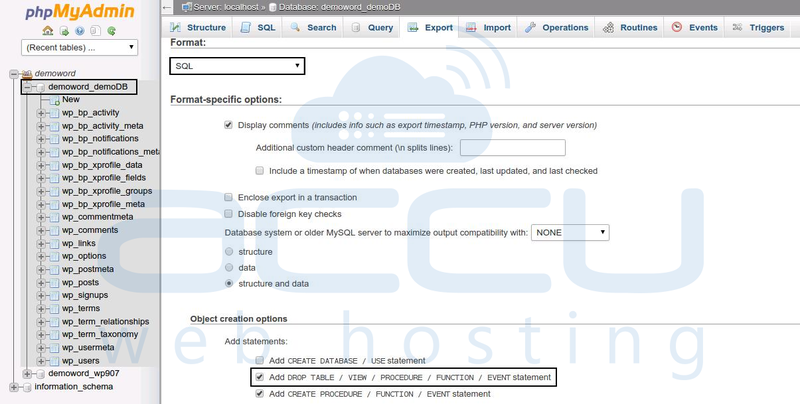 This article will provide you the step by step guidance on how to secure a backup of your MySQL database on your local system through phpMyAdmin..
Login to the phpMyAdmin from your hosting control panel. Select your database by clicking on database name e.g. demoword_demoDB. Verify the database name and select 'Custom - display all possible option'. After that select all or required tables that you want to export. Make sure that 'SQL'is slected in Format dropdown menu. Select 'Add DROP TABLE / VIEW / PROCEDURE / FUNCTION / EVENT Statement'. Once you click on 'Go', database backup will be generated and browser will start downloading backup file on your local machine.